In today’s complex application development the following points are always kept as a focus area. Application should be developed as a combination of modular components. All the components should be loosely coupled. Easy maintenance and enhancement of the application. Components can be reused in the existing or new application. Reduces the cost of maintenance and enhancement. Now to address these concerns spring has developed the concepts like IOC and AOP. We have already discussed IOC so now we will concentrate on AOP. AOP targets the application functionalities (like logging, transaction etc) which are used throughout the application in different areas. Using AOP these cross-cutting functionalities are developed as a reusable component and injected into the application where ever required. And again the entire configuration is done using xml file. 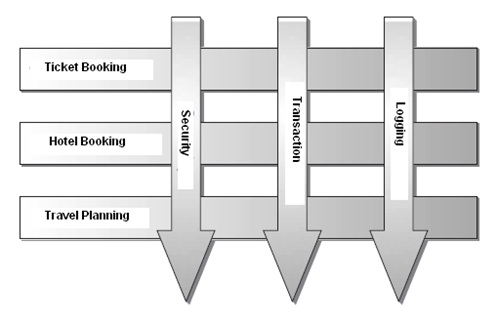 Following diagram shows a travel management system. ‘Ticket Booking’, ‘Hotel Booking’ and ‘Travel Planning’ are different functionalities. Now all of these functionalities require services like logging, transaction and security. So these are cross cutting concerns which come across all the modules. These concerns are developed based on the principle of AOP. All the common concerns are developed as a plug-in, so it can be used in future modules as well. You just need to configure it so that the service is also available in your new modules. This is the power of aspect oriented programming (AOP). AOP is also applied in enterprise level applications. In enterprise application, transaction, logging, security and many more features are there as cross cutting concerns. So all of these are developed as aspects and configured in xml file. The biggest advantage is loose coupling. As all the concerns are self-managed and independent, so you can change and enhance them as per your requirement without touching the application code. Now we will describe the AOP implementation by showing an example. To start with, first we will define an interface and its implementation class. This is a simple application to compare two integer values and return the result. Now we will write a simple advice to be called before calling the compare (int, int) method. The advice will be discussed in details in the following chapters. Now you can imagine advice as a task which will be plugged into the application through xml configuration. And this will be called before the method is called. But there will not have any direct coding inside the implementation class. We will only take before advice for the implementation class. Now the last part is the test class CompareTest.java. It loads the bean definition by using XMLBeanFactory class and then called the compare () method. Spring AOP is very helpful when we try to separate business logic from cross cutting concerns. It is widely used in different forms to cover various aspects. AOP can also be implemented in other programming languages. ← What are the benefits of using Cloud computing?